I think we can safely say that, in the grand scheme of things, the majority of games are violent. And that's cool, and all. There's an obvious difference between Mario Kart's level of cartoony violence, and Red Dead Redemption's "The game features exit wounds on gunshot victims" level of violence, after all. But generally, killing, harming, and combat in general . . . are largely unavoidable in video games. And that's something that by now, in mid 2014, we know, accept, and embrace. But that doesn't mean it's necessarily justified . . . right? No, I'm not here to tell you that "killing's wrong, yo", nor say "Ugh, why do ALL games have to be about violence?" or anything like that. I've spent way too much time on GTA:O to be a candidate for salvation, and I honestly don't regret it, either. I love fighting, when it comes down to it. It's the main reason why I signed off on a liability disclaimer sheet not too long ago when I joined a local Historical European Martial Arts club, no questions asked. Because hitting people with blunt metal objects is fun. And the thrill of having to fight for your life, look out behind you in case someone sneaks up on you, or have to run into cover, is something I can safely say EVERYONE who's ever played ANYTHING involving ANY type of simulated, recreational combat, can agree is enjoyable. It's just in our nature. Is downright physically assaulting people with harmful intent wrong? Yea, totally. But I'd say you probably have something bigger going on in your head to be concerned about than video games at that point. No, what I'm trying to do here, is just generally voice my dissatisfaction with the way the wrongness behind killing and harming people is misrepresented in games. I'm here to talk about morality systems, and why I feel they retract from a gaming experience. This is Grand Theft Auto 5. A pretty graphic game that features all that's wrong with society, while at the same time glorifying it. 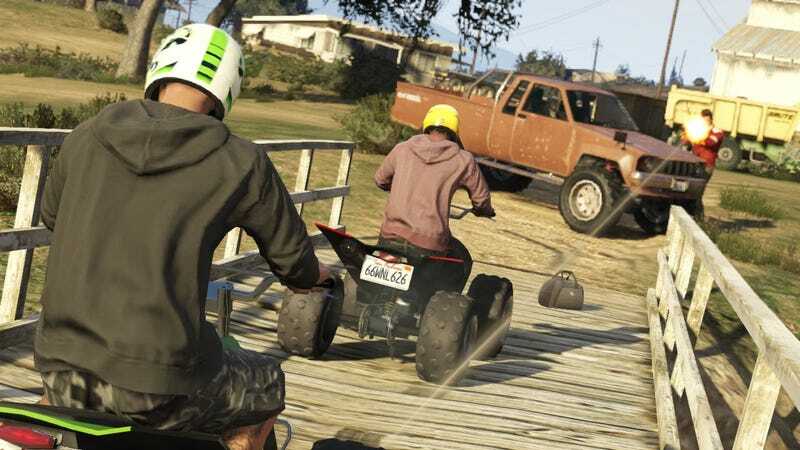 And boy is it fun to just run around in Freeroam, picking on other players, hijacking cars, and getting in intense shootouts to the death with the police. It's an open world chaos cocktail. And I love it that way. No remorse, no regret; just carnage. And here's Watch_Dogs. We see Aiden Pierce recklessly endangering numerous lives while trying to casually evade the police. A lot of what goes on in GTAV ALSO happens in Watch_Dogs: They're both open world, you can drive in both, you can shoot in both, you can rob stores in both, and you can also partake in intense suicidal shootouts with the police in both. But the real difference between these two games is that while you're just a common criminal in Los Santos in GTAV, dishing out mindless chaos and giving the media a reason to think guns are inherently bad . . . In Watch_Dogs you play as a master hacker/vigilante antihero. Dishing out your own sense of twisted justice, while proudly wearing that label of "vigilante" . . . Except that you don't. See, in Watch_Dogs, you have to conform to certain "morality rules", where running over civilians and accidental or deliberate killings of them result in points deducted from your honor or reputation. And while it's easy to agree with this system that killing is wrong, there are no repercussions whatsoever to stealing from their bank accounts, carjacking them, beating potential criminals down with a self-defense baton and just leaving them there. And honestly, that's what kinda bugged me. I mean, I don't mind acting out my vigilante fantasies in Watch_Dogs. I don't mind completely disregarding the value of life for criminals and cops in that game if it means "progressing" through the game or so. I loved the game, and loved being able to do all that . . . It's just that Watch_Dogs tried to tell me that it was wrong because "it's supposed to be wrong". In both GTA and Watch_Dogs, you shoot a gun, people call the cops, and you get chased down. You have the same propensity and suggestion towards fighting back, running away, or giving up and let "justice" be dealt out in both of these games. And it really feels like it's just there for the sake of being there. We can all agree that refusing to cooperate with authorities after an unlawful discharge of a firearm is wrong for all that the social contract stands for. But games treat this differently; authority is just a simple gameplay mechanic, and not meant for the sake of providing moral lessons. And yea, I get that to an extent. It'd be really problematic if the police didn't chase you down after a shootout in games. Can you imagine the media outrage? I get that it's there for the sake of saving face, and accept it. That's cool. But let's not pretend some of these morality systems actually mean something. We're being spoon fed "justice", and I don't always like that it gets in the way of my games if it's treated as a point system. I mean, if Aiden's pretty much got the mentality of a criminal, what's so wrong with whipping out an MP5 and riddling bloody holes into a dude who was about to physically assault his ex-girlfriend? At least GTA didn't pretend to know better. And that's something I can respect. Above, Sean C0nnery is gutpunching a dude in a tentacle-themed balaclava. FUN. Man, I used to love this game back in the day. It was so epic. So suave. So 007. Secret plots, gadgets, jetpacks, sweet cars, guns, secret lairs, Cold War era espionage. Everything I could really ask for in a 007 game. And not ONCE did I care about how many people I shot, riflebutted, exploded or ran over. Nor did I care about who those people were. And that's OK. They're just evil henchmen, bent on trying to crush the free world or something. It's been a while since I played it. And man, I used to be so boss at headshots. Above, we see Kiefer Sutherland hooking some marine right in the jaw. It's the more modern counterpart to the former example; Another game in the "Cold War era espionage" genre. It's a bit shinier, and with more features and a noticeable increase in explicit violence. But, in a very general sense . . . these two games *could* be said to be analogous in terms of their content. But the major difference between these two games is, the latter had me actually going out of my way to make sure I avoided as much combat as possible. "Yea, but this is a stealth game. From Russia With Love isn't, so it's obvious you want to not go trigger happy on people". Nah, they both had stealth segments, and you get shot at in both. You can also shoot back in both of these games, and here's why that emphasis matters: In Ground Zeroes, I knew who I was shooting at, and considered them people. They're just nice, upstanding marines, doing their job in a US Military Prison. And well, despite it being easy to mark down both these marines and the Octopus henchmen pictured above as "The bad guys", Ground Zeroes didn't make me feel that way. Those marines are people. They're honestly just a bunch of code, created with the intention of serving certain gameplay purposes, BUT . . . Ground Zeroes bothered to make them feel like people. And that's how I think morality should work in games. One of the things I've always loved about Metal Gear games is, it feels more realistic than a good chunk of other stealth games in the sense that there are other options for clearing an area besides just killing everyone in the room unseen. Nonlethal and stealth playthroughs are HIGHLY encouraged in this game, and a majority of the fanbase knows this, and even brags about it. It's not uncommon to hear "I played [insert MGS title here] under blah blah blah time, and with no kills or alerts". The game deducts points for kills. We know that. and that's cool. It doesn't necessarily make the game "good" in terms of morality, since the early games were pretty limited in what they could do . . . BUT, it makes the world feel more real, and make me feel like my actions have consequences. And when it comes down to it, that's what morality is about: Being responsible for your actions. You can listen to soldiers as they patrol their shifts, and hear little tidbits about them. How they feel. What they think. And I like that the series has recently making more advances towards portraying soldiers as people, and not just enemies . . . even if they're shooting at you. If you get caught, they open fire. I get that. I'm not supposed to be there, and I'd assume infiltrating a US Military Prison is HIGHLY illegal. And while we could go back and forth all day and night about the morality of laws, it doesn't change the fact that those people are armed soldiers who have a job to do, and are willing to open fire to do that job. As someone getting shot at and having my own goals as a player, I am also in a position to do the same. And that stuff happens all the time in the real world. And the people behind those incidents are real people who are definitely affected by it. Otherwise, PTSD and other issues on both sides wouldn't be a thing. In game, you get points taken off for kills. In the real world you face certain sanctions and punishments for deadly incidents. And at the end of the day, the only person who can tell you whether or not you feel bad for depriving a mother of their son, or wife and kids of their father- soldier, cop, or Octopus henchman, or random civilian -is you. And I think that's how it should be, and I think a lot of people in the industry miss the point. Games shouldn't tell you it's bad to prove a point, if they have a point to make. They should try to make you feel bad.